Did you know the human body needs to produce one million blood cells every second of every day to live? In patients with leukaemia, rapidly multiplying abnormal white blood cells outcompete healthy cells, leaving the body starved of oxygen and lacking immunity. Treatment for this disease includes chemotherapy that kill the leukaemia cells, but as a consequence, the healthy bone marrow cells are also destroyed. To replenish the bone marrow cells a stem cell transplant is given. But up until recently the process for harvesting stem cells for leukaemia treatment was a super invasive procedure that entailed an injection into the hip or spine to extract the stem cell rich marrow. Thankfully, these days stem cells can be harvested much less invasively through peripheral blood stem-cell transplants (PBSCTs), as an out-patient procedure. In a PBSCT, a donor’s stem cells are taken from their bloodstream and separated from their other blood components in a process called apheresis. The blood is then returned to the donor and the harvested stem cells frozen for later use. When a patient is ready, the stem cells are transplanted into their bloodstream intravenously. Normally, stem cells in the bloodstream are very rare and are insufficient in number to give a successful transplant. 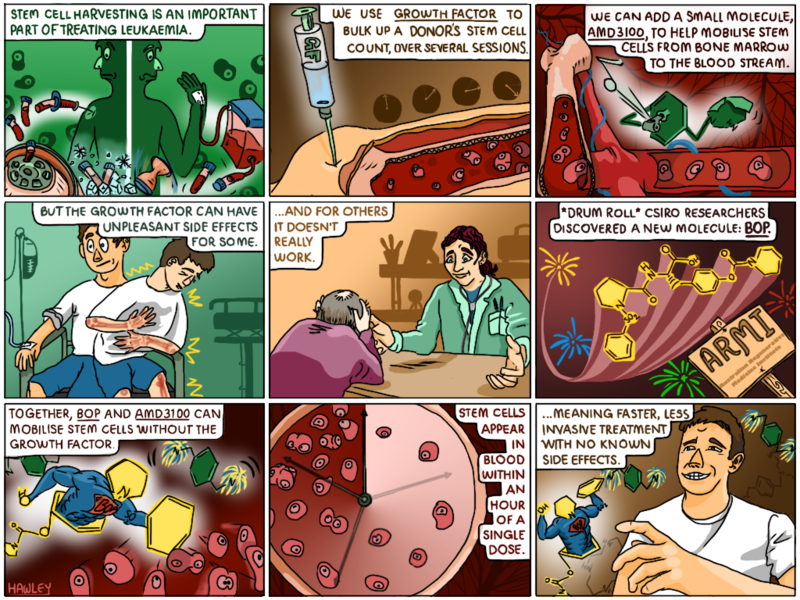 To stimulate the release of stem cells from the bone marrow, donors are injected with multiple doses of a substance known as a ‘growth factor’ (G-CSF). The injections, which are given in the stomach, leg or arm in the days leading up to the harvesting procedure, stimulate production of stem cells to the point that they can spill over from the marrow and into the blood, where they can be easily collected. This process is called stem cell mobilisation. G-CSF takes up to a week to take effect and in some cases, donors don’t respond well to the growth factor – that is, their stem cell count doesn’t get high enough for a successful transplant. To get around this, these ‘poor mobilisers’ are also given a dose of AMD3100 – a molecule that, when combined with the growth factor, can increase the number of stem cells in the blood, and therefore harvesting success rate. What AMD3100 can’t improve however, are the nasty side effects, like bone pain and spleen enlargement, that the growth factor can cause for some donors. Unfortunately, AMD3100 is not capable of mobilising enough stem cells when used alone for clinical transplant purposes. In light of this, our scientists were driven to find an alternative approach to stem cell harvesting that could eliminate the use of the growth factor. 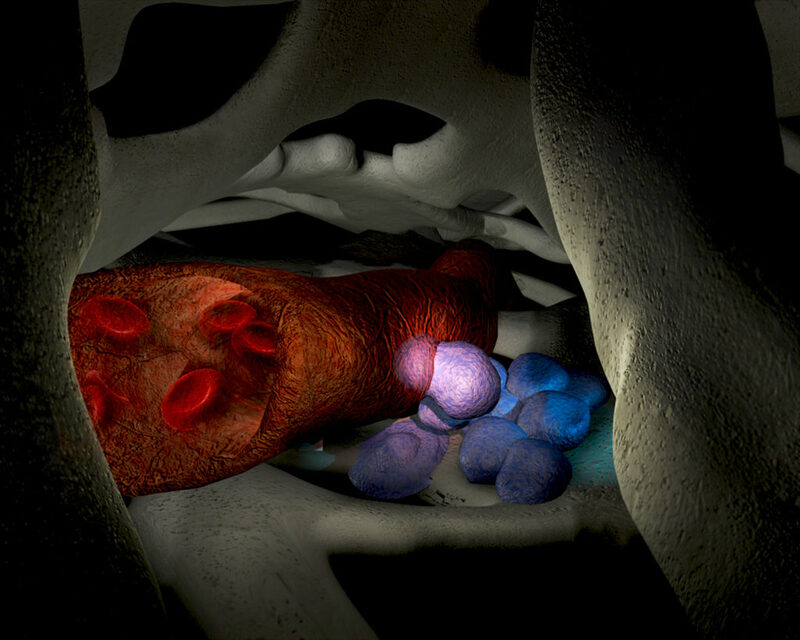 The team, led by Associate Professor Susie Nilsson, knew that the bone marrow stem cells that have the most potent activity like to anchor near the bone/bone marrow interface, or the endosteal region, and that one of their key characteristics is their ability to remain in a dormant state. There are proteins that help them do this. Called ECMs, or extracellular matrix, this collection of molecules play an important role in keeping stem cells in the right area and help to regulate their maintenance and function. Working out how to target these proteins to mobilise the stem cells could eliminate the need for growth factor, and get around the problem of side effects. So our team, together with the Australian Regenerative Medicine Institute (ARMI) at Monash, set about developing a molecule to do just this. 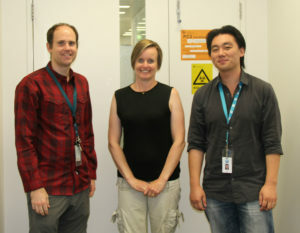 The ARMI research team behind the small molecule discovery (L-R) CSIRO’s Dr Chad Heazlewood, Dr Susie Nilsson and Dr Ben Cao. They discovered that if they combined their small molecule, N-(benzenesulfonyl)-L-proly1-L-0-(1 pyrrolidinycarbony1)tyrosine, or BOP for short, with AMD3100, they could adequately mobilise the stem cells without the need of growth factor. They also show that the molecule BOP specifically targets the potent endosteal stem cells in the bone marrow. It was found that a single dose of small molecule BOP, combined with AMD3100, could directly impact stem cells – and fast. Stem cells could be seen in the blood just one hour after dosage and when transplanted could replenish the entire bone marrow system. As well as causing no known side effects, the benefit of this discovery is that harvesting stem cells becomes even less invasive for patients who are already under considerable stress. Small molecule injections provide a ‘one stop’ deal where patients can come and go in the space of an hour for a stem cell harvesting procedure that used to take days. So far successful pre-clinical studies in mouse and human-mouse models have demonstrated the effectiveness of BOP. The next step is a phase 1 clinical trial assessing the combination of BOP molecule with growth factor, and phase 2, the successful combination of the two small molecules BOP and AMD3100. To find our more about ARMI, visit their website. Is this likely to help CLL patients? Whats the timeframe before it will be available st the major hospitals? What would we do without CSIRO. How long before this technique can be used on humans? My mother-in-law is currently undergoing stem cell harvesting as part of her multiple myeloma treatment. Could this method of stem cell harvesting be used in her case? Or is this Leukaemia-specific (I /think/ myeloma is cancer of different cells than leukaemia). Our results show this method of harvesting stem cells is highly effective in healthy donors but could also be used in both leukaemia and multiple myeloma patients. Clinically, the current routine method for harvesting stem cells from multiple myeloma patients requires the use of the growth factor G-CSF and we have evidence that demonstrates that the combination of our agent with this growth factor results in significantly enhanced stem cell harvests. Alternatively, stem cells could also be harvested from healthy donors using this method, and then subsequently be infused into multiple myeloma patients (allogeneic transplant) as part of their treatment.